Chris Knowles plays a variety of instruments; his principal instrument is the Celtic harp, and his other main instruments for traditional Celtic music are Irish bouzouki, whistle & low D whistle. He also often plays other styles of music, on electric mandolin and alto and soprano saxophones. 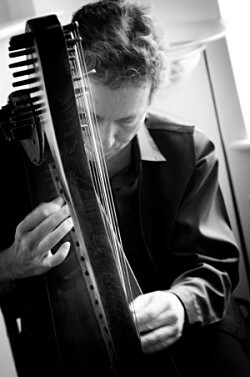 An established solo Celtic harpist, Chris has recorded 22 albums and has been a professional musician for 30 years with Celtic harp as his main instrument, specialising particularly in traditional Celtic music including much Irish, Welsh, and Scottish material, plus some Breton, Manx and Cornish music. He also plays some original material and live improvised music. For weddings & corporate bookings, he also offers a large selection of popular music on the harp, as an alternative to the trad. Celtic material. He also has a set of early/medieval/renaissance music. Chris has performed in widely varied venues including arts centres, concert halls, theatres, arts festivals, folk festivals, castles, hotels, museums, folk clubs, restaurants, on numerous TV and radio programmes, at open air concerts, green fairs, and 2 Glastonbury festivals. He has also played at a very large number of private events such as weddings, garden parties and corporate events. He was the official harpist at Caernarfon Castle in North Wales for 9 years, performing there several times per week in the summer months, and during those years he also played many live events at other castles in Wales for CADW. As well as his solo performances, Chris has worked in a number of duos and bands, including numerous performances and recordings with Welsh singer Heather Jones, fiddler Mike Lease, acoustic guitarist Anthony Griffiths, singer/songwriter Catrin O'Neill, and in particular with multi-instrumentalist & singer/songwriter Ben Walker. He also plays fiddle, whistles and sax with local North Wales-based ceilidh band Mooncoin.